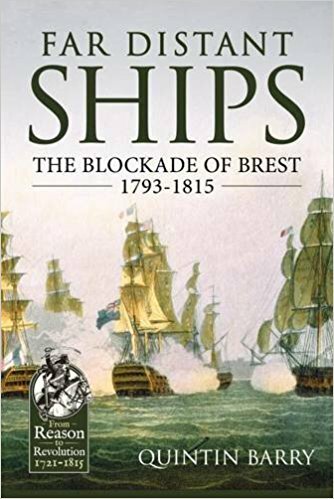 There were many aspects to the blockade of Brest, but always at its centre was the need to frustrate French attempts at the invasion of Britain or Ireland. Most famous of these, of course, was Napoleon's intricate combination that led to the campaign of Trafalgar, in the course of which his invasion plans disintegrated. But there were many other offensive moves which it was the blockading fleet's duty to prevent. Inevitably, there were great sea battles when the French ventured out, though fewer than might have been expected. For many months at a time the British fleet was at sea off Brest facing the considerable dangers of wind and weather without encountering its adversary. There were many remarkable leaders who came to the fore during the long years of war; Howe, Bridport, St Vincent, Cornwallis and Keith were among those who led the Channel Fleet. Nelson described his captains as a ‘band of brothers', but this was by no means a description that could be applied to the quarrelsome, self willed and argumentative group of men who held the destiny of the Royal Navy in their hands, whether at sea or around the boardroom table at the Admiralty. Drawing on the official and personal correspondence of those involved, this book traces the development of British naval strategy, as well as describing the crucial encounters between the rival fleets and the single ship actions which provided the press with a constant flow of news stories for its readers.